Homemaking | When Did This Become a Farm? One of the issues I have been fighting for the last couple of years seems to have found its cause. I have an allergy to peppers. Not peppercorns, which are not the same thing at all, but peppers. Bell peppers, chili peppers, cayenne peppers, ancho peppers, Anaheims, poblanos, jalapenos, and much to my dismay, paprika. I have a sensitivity to tomatoes as well, but nowhere near as severe. Potatoes seem to be okay. So I’ve had to eliminate peppers and reduce the use of tomato products. This has, as you can imagine, turned my kitchen life upside down. And my garden planning as well, because my garden for the last couple years was built around tomatoes and peppers, and now it can’t be. One of the things that made me wonder about this early on is the fact that my hands would hurt so much after simply dealing with tomato and pepper vines. Especially if I was pruning tomato vines and the juice leaking from the stalk got on my skin. 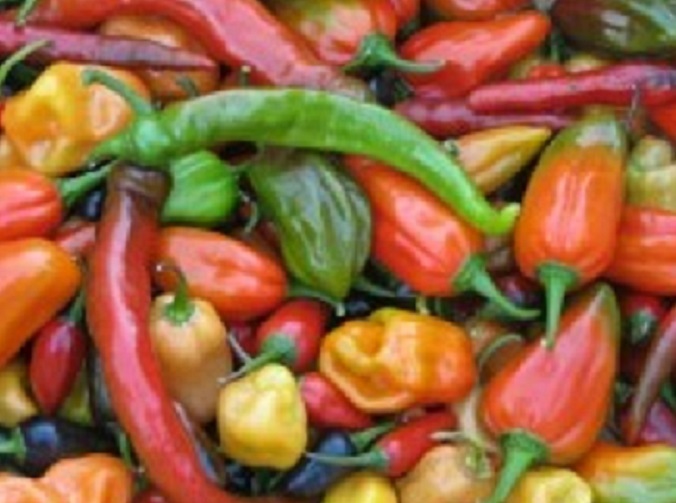 The joints in my fingers would be painful and the skin would erupt anywhere the vines or the peppers touched. The outsides of the peppers. This had nothing to do with the seeds or membranes at all as I always wear gloves when dealing with those. Even bell peppers were a problem now. I’ve been working to discover ways to try to eat some of my old favorites, using herbs, spices, and different peppercorns to try to come up with new recipes. I have had some successes and some failures, but I thought I’d share a couple of the successes with you today. The first is a nightshade free taco seasoning and the second is a nightshade free barbecue sauce. The taco seasoning is mild and if you want to kick it up a notch you can add 1/2 teaspoon of ground Szechuan peppercorns. I also cook my taco meat with 1 cup of diced yellow onions and I used to add in a pint of diced tomatoes with the juice, as the juice would be what would help the seasoning spread all around. Haven’t quite found a substitute for tomatoes there yet, but it is good without and I just use water instead for the liquid. Add 2 tsp Szechuan pepper to the above ingredients. Adjust to your heat tolerance from there. So the other day I made a video for my youtube channel of how I make my celery powder. I thought I’d put it up here as well. I know I’ve been neglecting the blog horribly. It’s been a crazy few months. I hope to post more soon. We have rabbits due to kindle this weekend. And maybe tomorrow I can do a catch-up post. When I first started raising rabbits, one of the hardest things for me was finding recipes I liked to cook them. I mean, we couldn’t have Southern Fried Rabbit all the time, though my daughter might beg to differ. Some recipes I found were so extraordinarily complicated that I knew I’d maybe make them once and never make them again. Slowly over the last three years I have developed my own recipes to my family’s tastes. A lot of them involve ground rabbit or canned rabbit, but I have been focusing on cut up pieces with the bone still in the last couple of months. I have definitely hit on a few winners. Here are two I have made this month and will be making again and again. Both are very simple crockpot recipes and can easily be pre-assembled into a Ziploc bag and frozen for future meals. This would come in very handy if my husband or my children needed to start something while I was out. I don’t find it hard to pour and measure and put it all together, but I find when it comes to my family, the easier I can make it for them, the better. Don’t raise rabbits? This works great with chicken as well, especially home-raised. Even with tougher, older birds, the slow cooking process will make them tender and falling off the bone delicious. I hope you all enjoy and have a lovely day. April seems like the off season for canning, but it is a great time to be putting up meat for those of us who butcher year round. In the last couple weeks I have canned rabbit and made and canned rabbit bone broth. I made videos of each and will post them here in case anyone would like to learn how to do so. It’s really not terribly complicated, but if it is not something you know how to do, maybe this can help make it a little less intimidating. I know it helped me greatly to watch videos when I was first learning how to pressure can. I also made a batch of rabbit jerky out of the abdominal flaps. I don’t recall if I ever posted my jerky video here or not, but it’s an even simpler process than canning. So it is nice to be able to put things into food storage at this time of year instead of just depleting the shelves. I have plans to make some dandelion jelly this week. I still have some left from the last time I made it, but with all those yellow flowers poking their heads up all over the place, I couldn’t resist. I’ve got the tea made and just need to make it into the jelly. I will probably do that tomorrow. The rabbit kits are all healthy and seem to be thriving. A couple of Bonnie’s kits were still smaller than I’d like at their age, but looked better than yesterday. We gave them an extra nursing session and they all looked great afterwards. I think maybe one more tomorrow and then they will probably be fine with just what mama does on her own. Cinnabun’s are all doing great. The smaller one yesterday looked a lot more filled out today and had a big rounded belly, so I am no longer concerned for it. I put out inquiries today looking for a broken New Zealand red buck. I decided I wanted to replace Wildfire and I should get solids out of him as well. If I can’t get a hold of one here then I will try for a broken black. If nothing else, the husband and I can make a trip to the farm where we got Wildfire from originally. They have both types of broken NZ’s there. I’ve been sick for quite some time and so haven’t really been taking the time to keep up with the blog. I do post on the youtube channel a lot, because that just requires me to talk with a camera and not sit down and actually formulate thoughts. Despite this long illness, I’ve managed to get quite a lot accomplished between now and the last few months of summer. I’ve filled 3 bookcases that are six feet high with food that I’ve canned, most rows are double stacked and 3 jars deep. I’ve got two more shelves filled with winter squashes and one more shelf filled with home canned food on a 4th bookcase. I feel really good about what I was able to grow this year and more than made my money back on the garden investment. The rabbits are doing well and I should have 4 does kindling this weekend. I will get some solid reds this time as I did a red doe/red buck pairing. I’ll also get two sets of solid whites and then one set of mixed kits from a red/white pairing. Assuming they all are pregnant. All 4 are nesting like mad, but Luna nested like mad the last two times she missed and Serena did the last time she missed as well. Kalia and Ruby are both showing other signs of impending motherhood as well, though, so I’m pretty sure we’ll at least get the mixed litter and the red litter. The ducks are finishing up their molt and looking really pretty again. I got 2 eggs today after going a few weeks only getting 1. My tom turkey George finished his molt and looks gorgeous. My hen turkey Gina is all bedraggled and in the middle of a molt, yet she is still laying. Not sure how that happens as it was my understanding that they don’t lay while badly in molt. Mabye that is just chickens and ducks? The 3 new pullets started laying couple of weeks ago and now their eggs are up to size. Both Auracanas and the other leghorn are laying, too. The garden is winding down, but I am still getting herbs, sorrel, kale, chard, celery, and lettuce to harvest. I have broccoli with heads on it growing. I have managed to plant 50 cloves of garlic, though I’d like to triple that. We haven’t had a frost yet, so we still could get the garlic in. I need to clip and transplant my strawberry runners. I do have frost blankets ready to save some things. I want to build a small hoop house over one of the garden beds and maybe grow a few things over the winter. We may be taking our son out of high school to home school. We’ll make that decision by weeks’ end. He’s not learning well there. Some of the classes are out of control. He’s frustrated. Anyway that’s the quick version of what I’ve been up to. I was interviewed last month by The Homestead Nation and it went up on youtube on Tuesday night. It talks about how I am raising meat animals, a big garden, and trying to be as self-sufficient as possible on half an acre in the city and what brought me on this journey. It was a really fun interview. Brad and Tommy are great. It’s a little over half an hour long, so make sure you have a chunk of time if you are going to watch it.